So what to do when those who preach to you are corrupt and hypocritical? Or you suspect them of being so. Separate the message from the man. Turn your devotion to Christ. Do the right thing for the love of Christ. Spend more time with Christ and Scripture, and less time with the politics of your church. Loading burdens onto people is one mark of a Pharisaical preacher (and perhaps an indicator of inner, hidden, secret sin). It may be irritating to see people achieve religious or churchly respect they don’t deserve. However, this is indeed a kind of slavery and servitude–to do everything for the sake of being seen.Never to enjoy simple humble anonymous pleasures and acts of goodness. The stress and lack of freedom this involves is not worth the respect they might gain. The Pharisees Jesus says love the places of honour at banquets, and the most important seats in the synagogues, they love the respect of men. And here is gets troubling, for most people do love honour, and respect, significance and importance. It is one of the great conscious or unconscious human quests. (Seating at banquets was assigned to guests according to their rank or status. 8 “But you are not to be called ‘Rabbi,’ for you have one Teacher, and you are all brothers. 9 And do not call anyone on earth ‘father,’ for you have one Father, and he is in heaven. 10 Nor are you to be called instructors, for you have one Instructor, the Messiah. And here is where Jesus’ teaching gets really challenging–and this is among the most challenging things he says. We are not to run after this sort of honour, recognition, praise and importance. He urges us to follow another sort of greatness. The greatest person is the one who can serve others. And then Jesus makes a prophetic statement which we Christians generally ignore. That the one who seeks to exalt himself–to show off, to blow his own trumpet, to be honoured– will inevitably be humbled. Those who seek to be humble will be exalted. But he who humbles himself will be exalted? What does that mean? 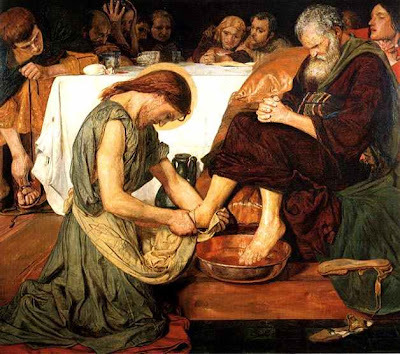 What does it mean to humble oneself? Not showing off, for starters. Taking on some “menial” tasks? Since I have experientially proved that so many things Jesus says are true, I take the things I have not yet proved on trust. Like his statement that those who humble themselves will be exalted. His advice to be gentle and humble. Not to show off. And that he will take responsibility for honouring the one who is humble and gentle. ESV Jesus’s disciples should not try to gain authority over each other as teachers and masters, since Jesus is ultimately each disciples’ teacher and master to whom each disciple is accountable.